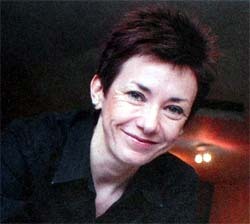 Amanda Whittington, a former journalist and English playwright, loves Bollywood films. She stumbled upon them in the late 1990s, after Hindi movies made a comeback to the big screen in Britain and mainstream cinema chains were looking at Bollywood as an emerging market, particularly those films that focused on the Indian diaspora. Whittington, 39, already has a reputation for writing plays that seldom failed to pull at the heartstrings. She claims that Bollywood enchanted her instantly and inspired her to use both the music and the theatricals in her own writing. When the Dennis Potter Screenwriting Awards (named after the celebrated screenwriter and instituted to nurture and encourage the works of writers) invited her to participate, she submitted 'Bollywood Jane' as a television script in 2001. 'Bollywood Jane', billed as a bolly good fusion between English theatre and Asian cinema, is yet to make it to television. However, the play opened to rave reviews, as an official event to the Fringe Festival of the very glamorous International Indian Film Academy (IIFA) awards held recently in Yorkshire. Soon after the special performance for the press at the prestigious West Yorkshire Playhouse in Leeds, the BBC gushed that the production was special for its spectacular Bollywood-style fantasy moments. The play is a bittersweet glimpse into the world of 16-year-old Jane, from a white working class family in Yorkshire, who finds it difficult to live up to the entrepreneurial ideals unleashed upon the country by former British prime minister Margaret Thatcher. Jane's life is shabby, to say the least. Her mother is an illiterate, clad in leather and always drunk. And Jane does not know who her father is. But, unlike her self-destructive mother, Jane discovers she has spirit. She experiences her spirit soar joyously after a chance peek at 'Dilwale Dulhaniya Le Jayenge' in a drab 1930s picture house. She is swept off her feet. Within moments, Bollywood has transported plain Jane from the grime of the kitchen sink to the world of community dancers who resemble sunflowers in one scene and, in the next, drop before the pretty protagonist like snowflakes. What Bollywood does to Jane is to rouse her dormant imagination. It lights up hope in her heart and the determination to seek out different ways to make her dreams come true. Bollywood makes Jane believe that miracles happen all the time. For Raj Parmar, an aspiring actor and one of the 40 dancers in the production, the play is much more than the fantasy of a poor white girl. "It is about the grim economic situation here that has affected everyone. It is about sexual awakening and racial tensions," he says. "It is a play about cultural difference as well as integration and my job was to reflect and to propel the drama through movement," adds Zoobin Surty, originally a Mumbai choreographer and classical dancer described by BBC Bradford as a West Yorkshire-based Bollywood dance specialist. For 'Bollywood Jane', Surty trained dancers, like Parmar, along with white Britons - some of whom had never danced before. 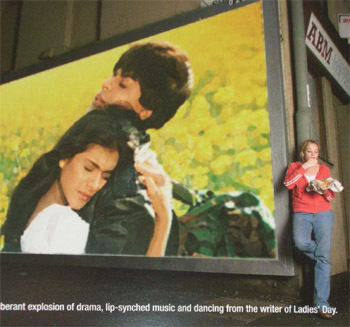 Bollywood was first introduced to post-war Britain when British Asian entrepreneurs took over cinema houses, left unused by white Britons, to screen popular Hindi films in the large urban cities of Birmingham and London. Reopened as theatres of Bollywood entertainment, most notably during the 1970s, the cinema halls were located in predominantly black and ethnic minority areas. The period lasted till the early 1980s, after which the arrival of the video cassette recorder (VCR) halted the British Bollywood cinema march. Then there was a revival in big budget spectacular movies around the year 2000. Today, there are over two million visits to Hindi films in the United Kingdom annually, and Hindi films remain the most popular foreign language films here. "This is partly to do with Indian filmmakers, who are pushing for international recognition of their work like never before," explains Dr Rajinder Dudrah, Senior Lecturer in Screen Studies, University of Manchester. Dudrah was also the curator of 'Celebrating Indian Cinema', an exhibition of Bollywood posters, photographs, promotional material, film clips and unique artefacts that opened at Bradford's National Media Museum to coincide with the main events of IIFA. Indian filmmakers in the past decade realised the enormous commercial opportunity in directly addressing the South Asian communities in the United Kingdom, Europe and America. It was video, at first, and then satellite television that opened up a global market for Indian cinema with promises of a great opportunity for both culture and commerce. It is estimated that 17 million people watch Indian films every day in cinemas or at home worldwide and annual revenues exceed 800 million pounds, according to reports by the Bollywood Initiative (BI), backed by Patricia Hewitt, British Member of Parliament. The BI was launched by a group of Asian entrepreneurs three years ago to raise millions of pounds as investment in Indian films, featuring Indian and British talent and filmed on location in the English Midlands. What makes Bollywood hot property in this region is the presence of large and economically active communities of South Asian origin that are heavy consumers of Indian films, film-inspired media and of live events. Leicester, for example, is second only to Birmingham and London these days as a key producer for Indian film-related content such as television software, music, DVDs and video as well as an offshore platform for distributing these in Europe and the US. Dudrah, whose exhibition has been a colourful introduction to the world of Bollywood, exploring 50 years of romance, song and dance, hopes that the audience will soon rise above the stereotype image of Bollywood films as only singing and dancing kitsch. "This is true about Bollywood, but only to a point. Now audiences must realise there is much more to Indian cinema than just song and dance. If they don't, then that would be a shame," he concludes.